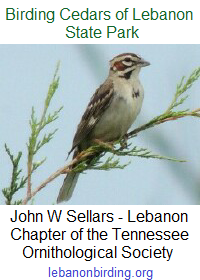 The second class of the Tennessee Naturalist Program at Cedars of Lebanon State Park, Geology & Ecology, will be held Saturday, 12 December 2015 at Cabin #13. The class will begin at 9:00 AM and will likely run long due to the amount of material to be covered. Please arrive before 9:00 AM to insure starting on time. Also, remember to bring your lunch with you.